Corkscrew can design, implement and maintain your web site according to your specifications.We do not use Template based designs. US$200 - US$2,000 Pricing based on programming hours. Recommended only for basic web presence sites. eCommerce functions will not be implemented on such sites to preserve customer security. US$1000 - US$20,000 Pricing based on programming hours and consulting hours required. Web site based on current technology DNN 7.4 and newer CMS Framework. Sites can be easily updated to eCommerce function within the existing framework. For security and integrity we will not support Flash or Shockwave. e-Commerce Web Site US$5,000 - US$100,000 Pricing based on programming hours and consulting hours required. Web site based on current technology High Performance DNN 7.4 and newer CMS Framework. Hosting maybe shared, dedicated or dedicated cluster as needed for the application. Other considerations include payment methods required for the web site and Merchant banking requirements. We currently offer 2 levels of eCommerce Software. The Basic version is suitable for most users. For those who need additional function, we offer an Enhanced version with multiple options. DNN is the preferred framework for creation of Solid, Reliable, Scalable, Secure web sites. Corkscrew International has used this Framework since 2004. The framework has evolved significantly since then and we have upgraded all customer sites to the latest version [currently 7.4.0]. We thoroughly test new release before committing them to customer sites. There is a more user customizable version of the framework which is marketed under the EVOQ brand. Currently we are evaluating this framework for customer application. The cost is considerably higher than sites built with the standard DNN framework, but is capable of integrating vast geographically dispersed corporate entities. The DNN Framework is a pre-requisite for development of our eCommerce Sites. We are using the CATALOOK application running under DNN to provide a robust and secure services. CATALOOK is a mature and reliable eCommerce Package developed in Germany. Corkscrew uses this package operating under the DNN Framework. The package provides EXTREME FLEXIBILITY in implementation and customization. There is an Annual Software Maintenance fee for all sites using this package. Development costs for CUSTOM VERSIONS are also available. The standard package with minimal customization will meet most customer requirements. Wordpress is a widely used system to produce quick results with some very imaginative designs. We host our Wordpress sites on Linux Servers. Wordpress does require significant assistance to provide a secure system. We provide the necessary plugins to promote security. Wordpress Updates are frequent. We implement systems which provide significant control to ensure that updates are applied in a timely manner. For many applications, Wordpress is sufficient to provide a stunning presence for the business. It is a lower cost alternative to DNN in many cases. It is not a recommended solution for eCommerce although it is possible and many sites employ WordPress for such solutions. We urge careful consideration when choosing Wordpress for eCommerce. We have received a number of queries and raised eyebrows regarding format of telephone numbers on web sites that we are maintaining. For clarification, all phone numbers should follow ITU format and include country code, area or region code, and finally the number. In no case should there be an access code in the number as this is wildly different country to country. By following the ITU standards we avoid any user confusion, no matter where in the world they are accessing the web site. Unfortunately, even with the ITU standards, there is wide variation country to country in the formatting of the full number. In all cases we follow the government standards adopted by the individual countries, but always follow the standard of the country for phones numbers of the country. Where multiple countries are involved, phone number formats will follow each specific country standards. In some cases there is no uniform standard for the number portion of the phone number. In these cases, numbers always follow the format 1-4, 2-4, 3-4 or 4-4 grouping. All ITU member countries are required to follow the ITU standards. The responsibility for Area/Region Codes and Numbers are the responsibility of the individual governments to regulate, define and standardize. Here are ten ways DNN can improve the SEO of your site. There are several key fields that search engines use in their ranking algorithms: page title (that’s the text you see in the title bar of the browser), meta description (that’s text describing your page to search engines, which your visitors don’t normally see) and ‘H’ tags, which are your H1/H2/H3 tags denoting which are the headers in your content. I disagree with the content of the Search Engine Watch article that suggests needing to modify the Meta Keyword tag. From all evidence I have seen, modern search engines simply ignore the contents of the Meta tag. Login as an Administrator, then go to the ‘Edit Page’ drop down on the top right hand side of the screen. Choose ‘Page Settings’ from that menu, and it will load up the settings for the page you’re currently browsing. 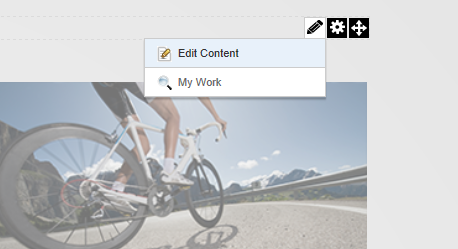 To modify the page title, edit the value in the ‘Page Title’ field. In my example below, I’ve chosen some words that we can assume match the keywords/phrases that our fictitious bike company uses. Try and keep the length below about 70 characters so that, when it gets displayed in a Search Engine Results Page (SERP), you can see the whole title. To change the Page Description, type into the ‘Description’ box. Remember that your visitors won’t see this on your site. The key to a good description is again hitting your keywords, but doing so in a way that actually reads well. If your page gets included in a SERP, it’s likely that the search engine will use the Page Description as the two or three line description for your page. Try and keep it to under 150 characters so that it stands a good chance of displaying nicely in a SERP listing, and the ratio of your keywords to the rest of the text is not too diluted. Pictured: Page Settings showing the Page Title and Description Fields. DNN doesn’t enforce the use of any particular H tag, so you’re free to edit one into your content however you like. It’s also possible to define a custom skin for your DNN site that shows a H1 for a specific page value (such as the module title for a piece of content). I’d recommend leaving any ‘H’ tags out of your skin and just making sure that you define a H1 tag for each separate piece of content that you write (like a blog post title, for example). But others may disagree with me and just be happy to define a H1 tag using the page name of each page. I prefer to customize every bit of content for maximum impact – but this does take much, much longer. 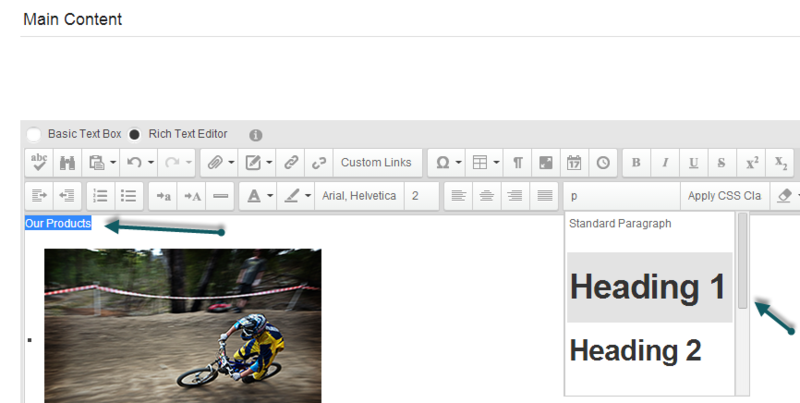 Use the ‘Edit this Page’ button in the ‘Edit Page’ dropdown to enter edit mode for the current page. Use the style drop down to select ‘Heading 1’. 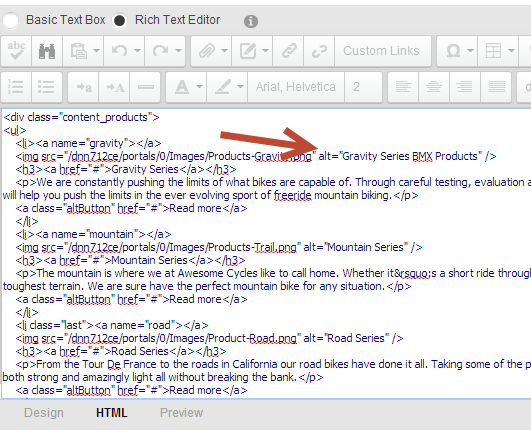 You can confirm the HTML is correct by switching to the ‘Html’ view within the HTML editor. The great thing about Evoq Content is the ability to swap components in and out as you need. There is a standard menu system that generates CSS-based menus. But if you don’t like that particular menu, you can choose from a range of different menu types to swap in to your site. So you are never locked in to a particular choice. The standard DNN 7 Skin uses the ‘DDR Menu’ component, which provides a CSS-based, simple menu system. The default skin provides a good jumping off point to develop your own skin – or you can purchase a multitude of skins from the DNN Store. The Search Engine Watch article covers URL Structure for two reasons:the first being the ability to set static, keyword focused URLs that are ‘sticky’ to your page. URLs are important for SEO purposes for a variety of reasons and paying close attention to them yields ranking benefits. A URL is what is used to link to your site – whether from an email, social media post, other blog post or just a plain old web link from another site. Links coming into your site have a large bearing on the ranking you receive from a search engine – all else being equal, a site with more links from high-quality sites will rank better. Paying attention to links is important for SEO. Any link is made up of two factors – the link text and the link URL. The link text is what the user sees – the link URL is what the user follows. Because of automated software and the ubiquity of copy/paste – sometimes the link text and the link URL are the same. This quirk of user behavior pays off when you have simple, descriptive URLs that also contain keywords. It benefits your page to be associated with your targeted keywords/phrases, but it also pays when someone links directly to your page using the URL as the link text. That is the first factor. The second factor for URLs is that search engines insist on each unique URL linking to a piece of unique content. That means you can only use one URL per page. If you use more than one URL for a piece of content, then search engines consider you to be creating duplicate content. A page with duplicate content issues will never rank as well as a page that does not. Because you have to choose a single URL for a piece of content (which is termed a ‘Canonical URL’ for the page), the choice of URL becomes important. Search engines do this on purpose – they want you to choose the most appropriate URL you can for that page, which means you can’t keyword stuff the URL and try and make it rank for everything. Because you have limited choice for the URL, the search engines can then use that as a ranking factor, knowing you have to choose your URL carefully. If you’re not paying attention to your URLs, you are leaving rankings on the table. It’s no surprise that Search Engine Watch mentions these two URL factors in their article – because they are both important. Luckily in DNN, elimination of duplicate content happens for you automatically – the system knows which is the correct URL for the page, and if you try and reach the page with another URL (for example, an older one you tried earlier), it will redirect the visitor to the correct, canonical URL. If you just changed the page URL, you’ll notice that when you updated the page settings, you will have been redirected to the new URL. In the image below (which is the same shown for  above), you’ll see I’ve chosen a URL which reflects the keywords/phrases. You should choose this carefully – it’s OK to make a URL which looks a little long and unwieldy – few people type URLs in – it’s worth it to use your targeted keywords/phrases. If you do have to have a URL typed in (for example, from a printed advertisement) then I recommend creating a redirect for that specific URL that goes to your page. That way you can still have an SEO-optimized URL for the page, but provide a short, simple URL for manual entry where needed. Above: showing how to set the Page URL. Note that it can bet set to any ‘level’ of the menu structure.Custom URLs do not inherit the parent paths of the URL, so they can be fully customized to whatever value suits the best. The Canonical link element is a way to inform search engines that a page might be available under a separate URL, but the canonical URL is the one to index the page for. The Canonical link element is commonly known as a ‘canonical tag’ because of the HTML tag used to create them. Essentially, a canonical tag means to ignore the requested URL as the canonical URL, and use the one listed in the tag instead. This tag is hidden in the HTML of the page (usually in the header) and visitors cannot see it. Canonical tags are very useful if small URL changes modify the display of content, but not the bulk of the content itself. An example might be a different URL to show different colors of a shirt available on an e-commerce site – the shirt is the same, but the URL may have "?color=red" or "?color=blue" on the end. DNN can show canonical tags in a variety of ways. If you have multiple domain names in use for a single site, then DNN gives you the option of specifying the primary domain using a canonical tag. 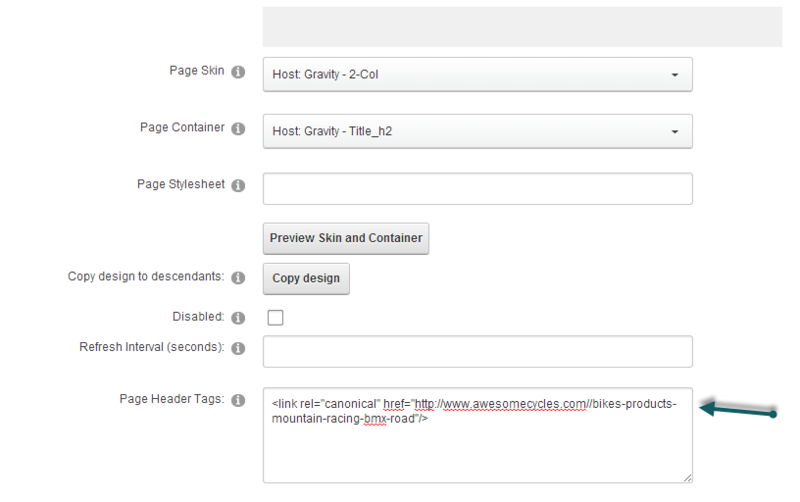 You can also set canonical tags for individual pages simply by adding one to the Page Settings itself. 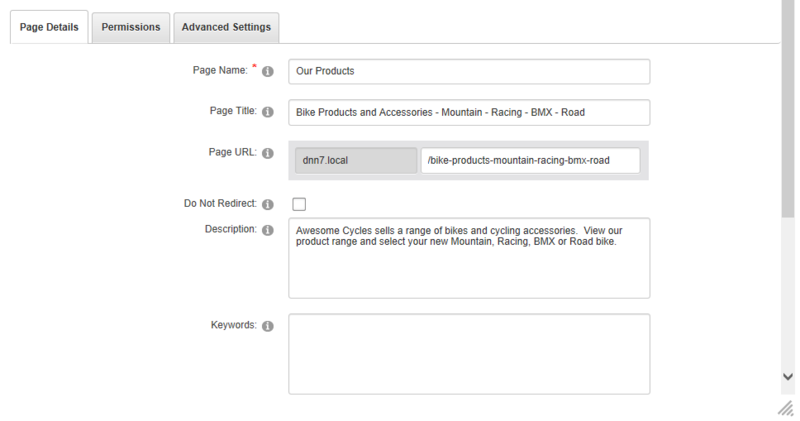 This gives you fine-grained control over a tag for a specific page. Finally, if you use, develop or purchase content-display modules (like Blog modules) then the software can generate the tag for you. Not only does DNN fully support canonical tags, it provides many ways for you to do so. The following image shows the Canonical Link element for the ‘Our Products’ page. An XML Sitemap (also called a Search Engine Sitemap) is a structured file containing a listing of all the publicly-available pages on your site that you would like a search engine to read and index. Often confused with navigation sitemaps – those pages which show all the visible pages as clickable links – search engine sitemaps are not seen by site visitors, but are instead read by search engine robots as they index a site. A Search Engine Sitemap provides a fast way for a search engine to read and understand the structure of a site. It also includes attributes for a page, which give the search engine insight on the relative importance of the page (compared to all other pages on the site) and the frequency of update. Frequency is a suggestion of how often the page should be re-visited for fresh content. Creating an XML Sitemap in DNN is easy. You don’t have to do a thing, it’s all done for you . DNN comes with a dynamic sitemap created by reading the current structure of the site. You can set the priority of the pages individually for each page. And when you install content modules to expand the functionality of your site, they have the ability to contribute entries to the sitemap as well, through an extension point called Sitemap Providers. 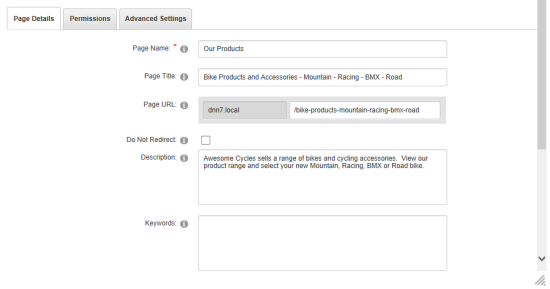 You will see the ‘Site Map URL’ section with a submit button next to it. Click ‘Submit’ to submit this to the selected Search Engine. This sends the sitemap URL to the search engine, who will store it and start reading it for indexing your site. It’s recommended for you to create a Webmaster account with each of the listed search engines, so that you can check to see that your sitemap is being read correctly and that you don’t have crawling errors. As the Search Engine Watch article says, hosting frames within pages makes it harder, if not impossible, for a search engine to understand a site. The answer for DNN is simple: we don't use Frames or IFrames anywhere. You can install IFrames if you want, but they aren’t used as part of the application. A redirect is an action that a web server gives when you request a URL that has moved somewhere else. The serverredirects the visitor to a new location. The numbers 301 and 302 refer to a status code used to give more context to the redirect. 301 means ‘moved permanently’ and 302 means ‘moved temporarily’. When you understand the difference, it’s obvious why search engines will only take action on updating an index if they read a 301 status code on a redirect. The search engines understand that the content for the old URL is now at the new URL, and so any links pointing to the old URL should now be considered to point at the new URL. As each link pointing to the page carries a ranking value, you want to make sure that the value of that link is transferred. This is what a 301 redirect does – and it also makes sure your visitors don’t get lost if they use an old URL. For most redirects in DNN, a 301 redirect is issued. This is used when changing domain names, for when pages are renamed or moved, and for when administrators purposely create a redirect to point an old URL at a new location. 302 redirects are used to redirect a visitor to a login page if they try and access secured content, and for some other temporary redirect purposes. DNN complies with the need for 301 redirects over 302 redirects. You will also see a list of ‘System Generated’ URLs. These are all the URLs the system has generated for the page, including any old URLs where the page name might have been changed, or the page was moved in the hierarchy of the site. They may also include variations on URLs where the system options were changed, such as URLs that were applicable in earlier DNN versions. The System Generated URLs show automatic redirections that are done on your behalf, to maximize the value of your existing URLs – translating to better rankings through avoiding lost and broken links. An ‘Alt’ tag is the text description attached to an image on a page. These are used by search engines to understand the contents and context of an image on a specific page. The Alt tags are used not only to index the images on a page, but also as a way of weighting the content of the entire page. Alt tags carry ranking weight because typically an image on a page is highly relevant to the content on that page. 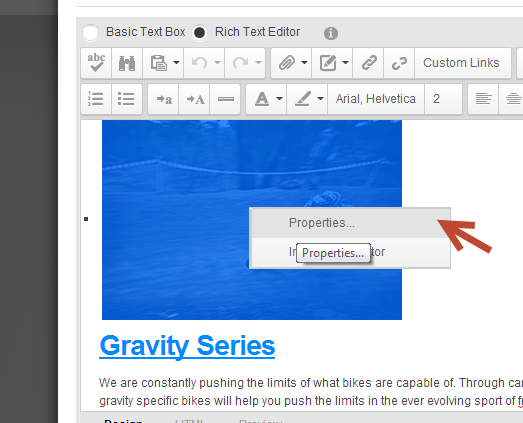 In the image properties, update the ‘alt’ text field. Choose a phrase which best suits the image, and which also matches the desired search terms or search phrase you want the page to rank for. You can check the HTML for the specific image you are setting the Alt tag for – here you can see the HTML tag has been updated as we would expect. Click on Update to update the page. Note: perform these set of steps for each image embedded in your content. Breadcrumb navigation is the practice of leaving links (typically in the header of a site) which give the visitor visual feedback on where they are within the site. This gives them an easy ‘breadcrumb’ to follow back to the higher levels of content and also provides context of the current page. 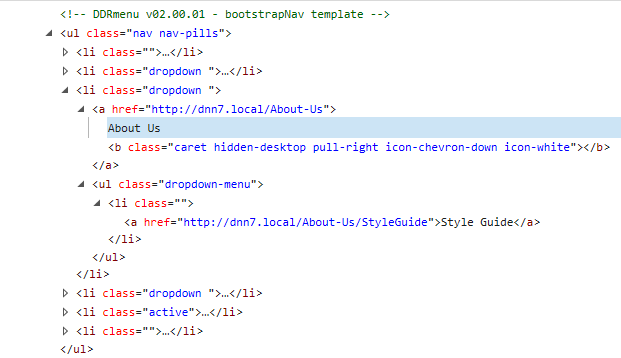 Like CSS menus, breadcrumbs are an entirely customizable part of DNN. 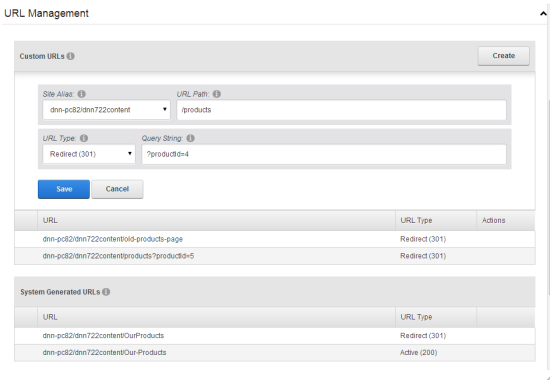 The standard skin that comes bundled with DNN 7 includes breadcrumb navigation based on the names of the pages. But it’s easy to change this to something else, or to write your own breadcrumb system yourself. This is all done through the magic of skinning – where you can change the appearance and behaviour of a DNN site without changing the underlying system code. At runtime, the skin object applies to the current page in the hierarchy and shows the breadcrumb levels including the URLs for the page. Different breadcrumb layouts can be achieved by varying use of the skin object – and it’s possible to replace the standard skin object with one of your own design. Breadcrumbs are great for giving internal links, great for helping visitors find their way in the site, and help with site SEO. In the previous ten topics, you’ve read some important factors for optimizing your search engine ranking – and found out that DNN supports each and every one. Using DNN maximizes your chances of a high ranking and the traffic that flows from that. Unlike other CMS solutions that may stand in the way of achieving results in your search programs, DNN provides clear pathways to optimize your way to success. If you have a DNN site, then it is a good idea to work through this list and see that you are maximizing each one of the areas covered. These on-page optimizations are simple to do and should be included in the SEO program of every site. If you have other suggestions or tips for SEO using DNN, then please share in the comments.